“Can’t today be a rest day?” I asked. Drat. He was going to be disciplined and stick to the half marathon training plan that I’d printed out and stuck to the refrigerator door. So I changed into my running clothes and put on my running shoes, and we went out for a forty-minute run, according to schedule. I spent the first half hour alternating between being mad at my husband and trying to distract myself from the various aches and pains that were developing along my hamstrings and shins and the arches of my feet. I spent the last ten minutes focused on just getting home and putting this run behind me. Just as it is with every long run that I complete, by the time I got home, I felt pretty good about what I’d accomplished, and I was back to liking my husband again. Especially since he’d made puttanesca while I was at work, and we would be able to sit down to eat in a matter of minutes. 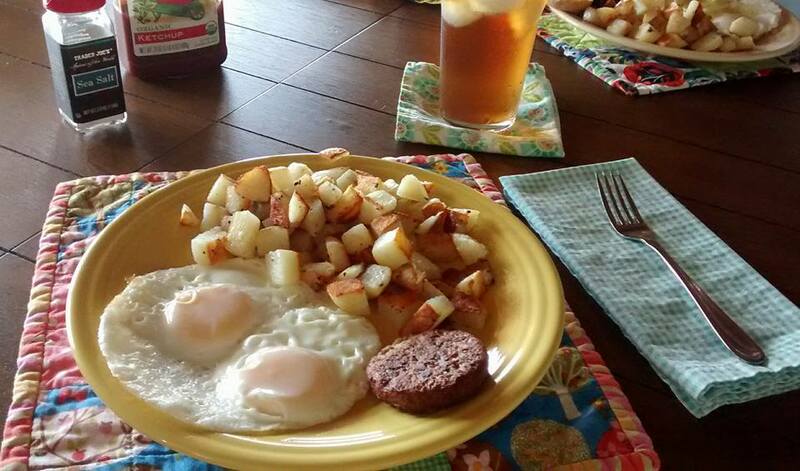 I didn’t take any photos of our dinner, but here is one from our 4th of July breakfast that Sean made. My contribution was the handmade quilted placemats and handmade napkins. Even though he won’t let me slack off the training schedule, he does make the best breakfast. Categories: Adventures with Sean, Fitness, Handmade | Tags: fitness, Morro Bay, napkins, patchwork, patchwork blocks, quilted, Sean | Permalink.